I bought a watermelon today to make "Frozen Watermelon-Lime Bars". Line a 9-inch square baking pan (2 inches deep) with plastic wrap, leaving a 2-inch overhang. Put lined pan in freezer. Coarsely chop watermelon flesh (leave seeds in), then purée enough to yield 2 1/2 cups in a blender. Strain this quickly to take off about 1/4 cup of juice. Return flesh to blender and add sugar, juice, and tequila to purée and blend 30 seconds. Freeze sorbet in ice cream maker. Transfer to lined baking pan, smoothing top. Put in freezer to harden, for 1 hour. Break up the semi-frozen watermelon sorbet with a spoon, and then smooth it out again. Freeze another 30-60 minutes. Whisk together condensed milk, zest, and juice. Beat cream until it just holds stiff peaks, then gently fold into condensed-milk mixture. Spread over sorbet (after the 2-stage freeze), smoothing top. Freeze until solid, at least 2 hours. The recipe actually caught my eye in an ad for the new Gourmet app. I don't have an iPad, so no comment on the app functionality, but I am glad there is some hope for the Gourmet brand yet. I actually think it's a really interesting development, and don't have the reflexive, "OMG, it's franken-magazine!" response which seems to be the default reaction. Maybe I have worked in technology too long. I am curious whether this was a McKinsey recommendation, an after thought, or the work of yet another consulting company (my guess, the latter). 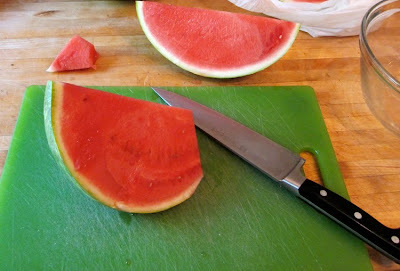 Chop the watermelon into chunks-- about 2 inches square. Toss with other ingredients, and enjoy-- don't mix until right before you are ready to eat. All of this was inspired by experimenting with making Horchata for my son, who is addicted, and spends about an hour every Saturday morning (from the time we hang up from chatting with Nonna and Babbo, until the moment we arrive at the stand at Alemany) chanting "Horchada! Horchada! Farmer's Eat!". I started with this recipe, but I am still working on it. Too powdery. And I think my cinnamon was a little stale, even thought I bought it today. Next time, a trip to La Palma is in order. If only Nopalito would just publish a cookbook already. Which is another way to say that while the green tacos were AWESOME tonight, I still can't even come close to Nopalito's, and no recipe yet.